I figured since this blog is suppose to be about all of the things I love, food included, I should share some recipes. I haven't had a lot of time for cooking lately between going to work and the puppy, so here are some past simple appetizer recipes that I highly recommend. The first could not be any simpler. To make these mini mozzarella, tomato and basil skewers simply get a toothpick. 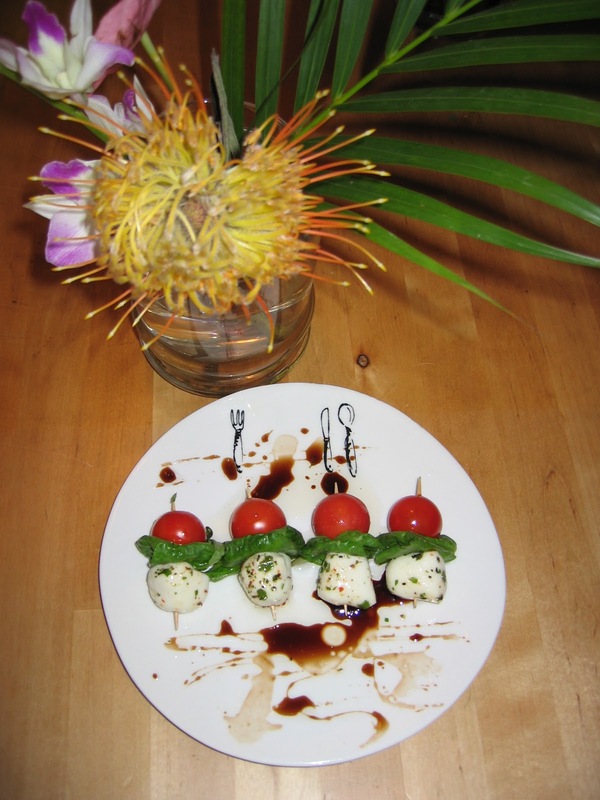 Place the cherry tomato on toothpick with a small piece of basil and the mozzarella ball. I used tomatoes from my garden last summer to make these and they were delicious! I also recommend purchasing the marinated mozzarella balls to add some flavor. When you are done assembling drizzle with a little olive oil and balsamic vinaigrette and you're done! The second appetizer I simply call "Jacques Pepin Rolls." The reason? Because I got the idea from my all time favorite chef in the whole world, Jacques Pepin! It may be hard to see from the picture, but these are zucchini, cream cheese and salmon rolls. Simply shave zucchini with a vegetable peeler, place a strip of salmon on top, then spread some whipped cream cheese over the salmon. The cream cheese will bind it together. Sprinkle with a dash of pepper and roll! I place the rolls on elegant water crackers. In this picture I cut up baby carrots for some color in my plating of this appetizer. My husband loves these! I don't know how they taste because I don't eat any kind of fish, but according to him they're great!